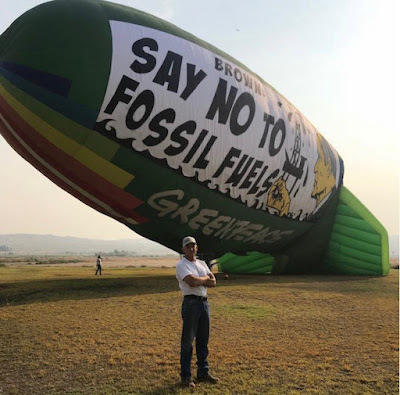 Soon after the blimp touched down, Taft Mayor Dave Noerr stopped by to try to reason with the activists, an exchange that was captured by the Taft Independentnewspaper on Facebook Live. Upon arrival, Mayor Noerr asked: “What powers this thing? Is that propane?” highlighting the irony of using a large, fossil fuel-powered, petroleum-based polyester airship to protest the production of fossil fuels. Yes, it's another joke from GreenPeace jokers. They hate fossil fuels then frequently travel to many countries not on giant kites or Uber brooms or solar planes but fossil fuel-powered planes. And this balloon powered by propane, a fossil fuel. GPeace, WWF, Al Gore, UN motto is simple: keep fooling people on climate and fossil fuels, they feel good at being fooled and they continue sending money. The Economist cover story, like so many other stories these last weeks, claim that forest fires are exceptional and record-breaking: "EARTH is smouldering. 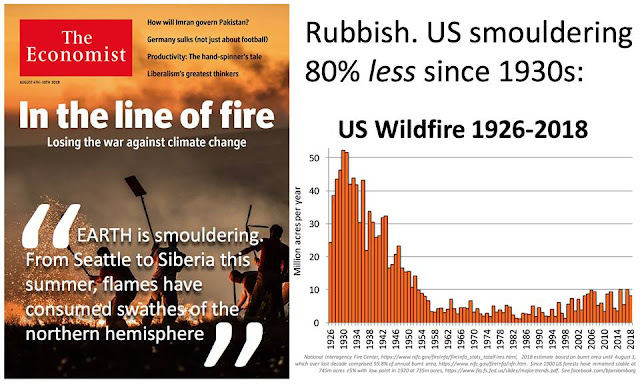 From Seattle to Siberia this summer, flames have consumed swathes of the northern hemisphere"
As is evident, US burnt forest area has dramatically *declined* since the 1920s, 1930s and 1940, after which widespread fire suppression was introduced. As more burnable mass is piling up, fire is going up slightly. Now, it appears probable that global warming will lead to somewhat more forest fires. But it is important to get a sense of proportion. US fires were *much* more destructive in the first part of last century. Overall, 2018 will likely see burnt area of one-fifth of the average burnt area in the US in the 1930s. The US is smouldering less, not more. Since 1900 US foreests have remained stable at 745m acres ±5% with a low point in 1920 at 735m acres, https://www.fia.fs.fed.us/slides/major-trends.pdf. The Economist, Al Gore, UN FCCC, etc are panicking that the $100 B/year climate extortion from taxpayers of rich countries are nowhere to be found. These “planet saviors” often travel in business class to espouse their crusade in global conventions/conferences, announce and brag it. They fly from Europa and America to Asia on fossil fuel-guzzling planes then lambast fossil fuel. Then they fly back from Asia to America and Europa and lambast fossil fuel again.